The Effective Date is the end of the fiscal year for which you elect to adopt the new lease standard. For example, if you decide to adopt the new lease standard early for your fiscal year ending 2018 and your fiscal year-end is September 30, then your Effective Date is September 30, 2018. Employee benefit plans that files financial statements with the SEC. For example, if you are a publicly held company and your fiscal year end is December 31, then your Effective Date is December 31, 2019. For all other organizations, the effective date is fiscal years beginning after December 15, 2019. For example, if you are a privately held company with a fiscal year end of March 31, your Effective Date is March 31, 2021. Now that you know your effective date, you can figure out your Initial Application Date. This is the first day of the first fiscal year represented in your financial statements. For example, if your Effective Date is December 31, 2019 and you have three comparative years in your financial reports, then your Initial Application Date is January 1, 2017. If your Effective Date is March 31, 2021 and you have two comparative years in your financial reports, then your Initial Application Date is April 1, 2019. Why do you care about the Initial Application Date? Because the time between your Initial Application Date and the Effective Date is called the Transition Period. During this time, you don’t quite follow the old standards nor do you completely move to the new standards. 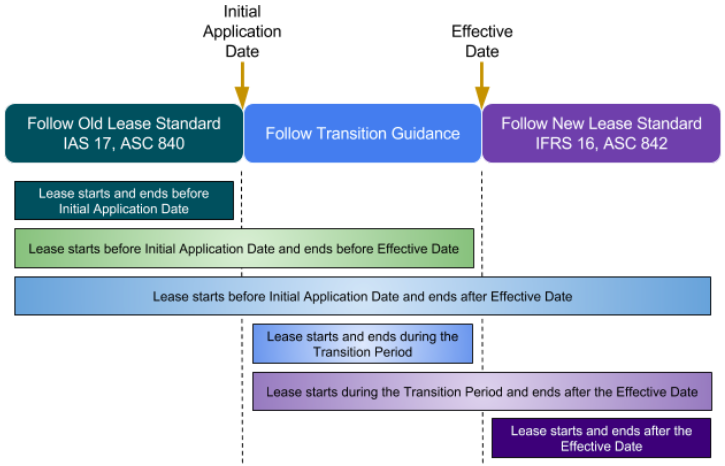 While this is fairly complicated to figure out, the good news is that there are practical expedients available to simplify the work required during the transition period, particularly around whether or not the lessee needs to reassess expired or existing leases, as well as the ability to use hindsight on renewal and purchase options. Even better, the FASB has issued a new practical expedient that allows organizations to not restate prior years in comparative financial statements. If you follow IFRS, this is already allowed. An important date for individual leases is the Commencement Date, which is the date when the underlying asset is available for use by the lessee. It’s important to note that this may not be the date when the lessee enters into the agreement with a lessor. Lease classification and measurement should take place at the commencement date. Sometimes leases are renegotiated. If this results in a new contract, renewal, or other extension not previously anticipated, it is treated as a new lease. Otherwise, assumptions such as the discount rate, fair value, and remaining economic life of the underlying asset are reviewed and updated as of the Modification Effective Date, with modification gains and losses also recognized as of the same date. Other times, a triggering event occurs that was not otherwise anticipated. Generally, this is something that requires the lessee to reassess the lease term. The date as of which this triggering event occurs is called the Remeasurement Date. Note that the lessee should also update the discount rate and any variable lease payments as of the Remeasurement Date.